Have you ever learned how to make a Sally Lunn bread recipe? This recipe has a lot of speculative history and legend surrounding it. The story starts as Sally Lunn was a young girl in France. She took a job for a baker to sell his baked goods on the streets. Here is where her talent for baking bread was discovered. She had such a skill at baking brioche bread that the customers would only eat the bread that she made. Later Sally Lunn arrived in Bath England in the late sixteen hundreds as a French refugee. She took another job at what is now called the Sally Lunn House. Here she developed the recipe for rich round brioche and she taught herself how to make the Sally Lunn bread recipe. Some thought that she might have developed this rich egg bread off the French solilemme bread from Eastern France; the dough and serving method are much alike. Today all over the world people have taught themselves how to make the Sally Lunn Bread recipe in many different versions. The original Sally Lunn bread recipe (or “receipt” back then) is yeast bread. 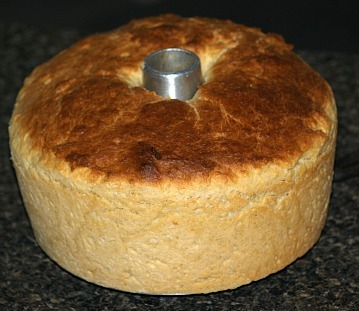 Some call it bread and some call it cake; it is baked in a cake pan, loaf pan, muffin pan or many other pans. The recipes floating around today by this name vary greatly; most are a yeast recipe but many are also made with other leavenings like baking powder and are more like a quick bread. Differing from most breads the Sally Lunn bread recipe is traditionally sliced in a horizontal direction. It is then toasted and spread with butter, jams or jellies. There is documentation of putting the slices back together after spreading with flavorful spreads then slicing the warm loaf in vertical slices to serve. Preheat oven to 350F degrees; butter well a funnel cake pan. Soak yeast in warm water; let set 5 minutes. In a large bowl beat eggs until light; add milk, butter, sugar, salt and yeast mixture beating well. Beat in 1 1/2 cups of flour. With a heavy spoon stir in remaining flour; cover and let set to rise to double in bulk. Beat down with a spoon and pour into a funnel (angel food) cake pan. Let rise again until double in bulk; bake for 40 to 45 minutes. Grease muffin tin heavily with butter. Sift the flour baking powder and salt together; set aside. Add sugar to the eggs and beat until light. Beat in melted butter. Combine the sifted ingredients to the creamed mixture alternating with the milk. Beat until well blended and bake in muffin tin until pick come out clean. This no knead recipe is easy to make. When milk has cooled add yeast and sugar to milk. Pour warm milk mixture over flour mixture in bowl; stir vigorously with spoon. Add enough of last cup of flour to make dough; DO NOT KNEAD. Cover with plastic wrap and towels; set to rise in warm place until double in bulk about 1 to 1 ½ hours. Punch down with spoon; spoon into lightly greased 10 inch tube pan. Cover and let rise in warm place until double; 1 hour. Preheat oven to 350F degrees; bake about 50 to 60 minutes. Combine 2 cups of the flour, ½ cup of sugar, yeast and salt in mixing bowl. Warm milk and butter to about 112F to 115F degrees stirring to melt butter. Add to flour mixture with eggs; beat with mixer until well blended. Beat in remaining flour by hand; cover and let stand in warm place to rise until doubled in bulk about 1 hour. Grease and sugar a 10 inch tube pan; stir down dough and pour into prepared pan. Cover and let rise in a warm place until double in bulk about 30 minutes. 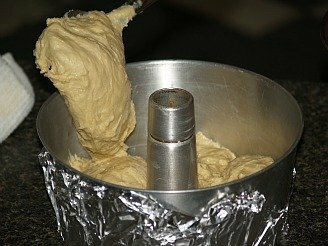 Combine the ¼ cup sugar and nutmeg; sprinkle over the dough. Bake about 40 minutes; cool in pan 5 minutes and remove from pan. Serve warm with strawberries and whipped cream. Preheat oven to 425F degrees; grease well a 9X13 inch baking pan. Cream sugar and shortening; beat in eggs. Sift together flour, baking powder and salt, add to creamed mixture alternating with the milk. Pour batter into prepared pan; bake about 25 minutes; cut in squares and serve with butter while hot. Add butter and sugar to milk; beat in eggs. Dissolve yeast in the milk mixture; stir in flour. Cover and let stand in warm place to rise until doubled in bulk about 1 hour. Stir down and let rise again; stir down again and put batter in greased pan. Let loaf rise to top of pan; PREHEAT OVEN TO 350F degrees.